Welcome to the A.J. 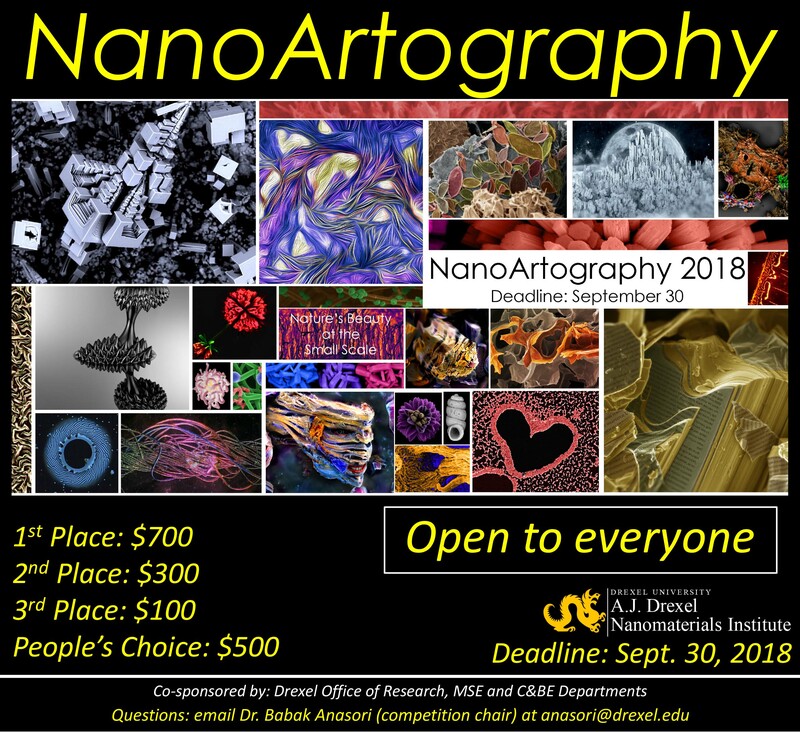 Drexel Nanomaterials Institute NanoArtography Competition! Present your research through an artistic image! For further information, email Dr. Babak Anasori (competition chair) at anasori@drexel.edu. 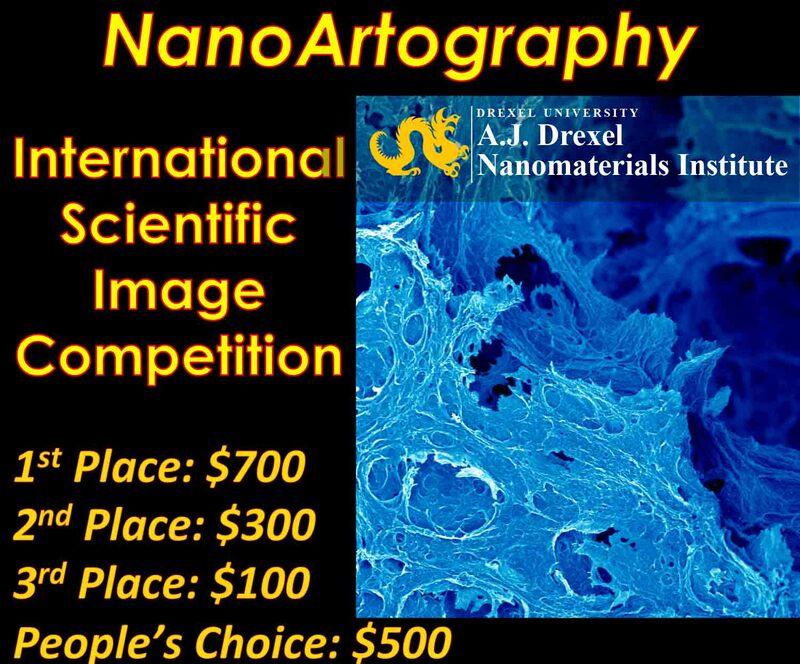 Contest images, voting, and awards are announced on the NanoArtography Competition Facebook page. 1st, 2nd, and 3rd Place will be awarded based on Judges’ choice. People’s Choice will be selected as the image with the highest number of Likes on the competition Facebook page. The NanoArtography committee reserves the right to make the final decision for the People’s Choice Award. Please continue to check our Facebook page for updates! This online international competition is open to all students and researchers (domestic and international) creating artistic scientific images. Any kind of B&W or colorized microscopy images, computational simulations, or combination of both, etc. No more than three entries are allowed per individual or team. The submitting individual should also fill out and sign the image permission file and submit it with each entry. People’s Choice selection: Top finalists will be posted on NanoArtography Facebook page for public voting from October 19th, 2018 to 4pm EST, November 6th, 2018. Facebook likes for the People’s Choice will be monitored for authenticity by the NanoArtography Committee. Contest winners will be featured on the A.J. Drexel Nanomaterials Institute 2019 calendar. Thank you to all who have submitted! We appreciate the artwork we have received from all over the world! FIRST PLACE: CoS2 based Nano-Micro battle stations ready for combat by Mohit Saraf, Indian Institute of Technology Indore, India. This type of never seen before morphology was grown by a simple hydrothermal reaction. Out of plethora of materials available in the literature, this unique morphology was obtained in an attempt to synthesize CoS2 nanomaterials. We believe that this type of nano-micro structure represents futuristic battle stations, which are ready to combat anytime. Scale bar is 0.002 mm. SECOND PLACE (tie two ways): A Polymer Whirled by Sarah Gleeson, Drexel University, Pennsylvania, USA. 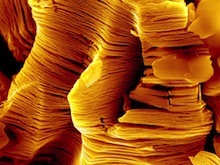 This image shows the cross-sectional edge of a polycaprolactone coating, captured with a scanning electron microscope. This coating creates a neutral surface on a polycaprolactone-block-poly (acrylic acid) single crystal film, to prevent mineral overgrowth when placed into a body-mimicking ion solution. 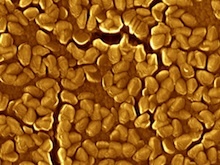 The semicrystalline polymer film is typicallycharacterized by hard jagged faces and distinct striated lamellae. It was striking to see this portion of the coating which had coiled upon itself after being fractured, creating beautiful concentric wrinkles against a smooth polymer backdrop. Image width is 0.055 mm. SECOND PLACE (tie two ways): Hellfire by Jizhen Zhang, Institute for Frontier Materials, Deakin University, Geelong, Australia. The image represents cross-section of MXene (Ti3C2Tx) aerogel film prepared by freeze-drying approach being developed by our research group. The combination of MXene flakes and porous forms flame–like architecture. The MXene aerogel film with highly aligned MXene flakes and connected interspace enable high rate charge and discharge for energy storage applications. This image was captured use a scanning electron microscope image. Image width is 0.2 mm. THIRD PLACE (tie in three ways): Floating Zinc Lotus by Shayan Kaviani, University of Nebraska-Lincoln, Nebraska, USA. 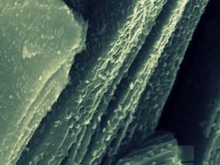 The image presents a flower-like zinc oxide nanostructure, grown on zinc-oxide nanowires, with wurtzite crystal phase. 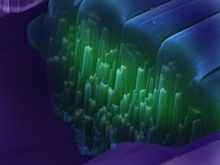 The ZnO flowers and nanowires are produced using chemical batch deposition (CBD) technique. The image is colored as a purple lotus flower floating on water. The image width is 0.030 mm. THIRD PLACE (tie in three ways): Time for Fall: Manganese Oxide by Mallory Clites, Drexel University, Pennsylvania, USA. Nanorods of manganese oxide are formed via hydrothermal treatment and then broken down slightly using acid leaching. The effect creates an array of small, broken fall leaves. Image width is 0.1 mm. 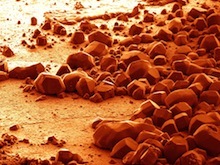 THIRD PLACE (tie in three ways): Nano Volcano by Simge Uzun, A.J. Drexel Nanomaterials Institute, Drexel University, Pennsylvania, USA. 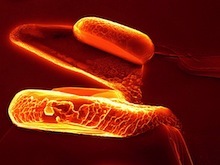 The Nano Volcano is an SEM image of a wet-spun polymer-based MXene fiber. Polyethylene glycol (PEG) and Ti3C2 MXene dispersions are mixed in water, and the solution is used to extrude these hybrid fibers. Here, the composite MXene fiber is represented as an active volcano, where immense amount of energy can be released. Similarly, in this photo, we see the deeper layers of a functional fiber that has the capability to store energy. Image width is 0.24 mm. People’s Choice: Antman by Alberto Brambila Solórzano, Colima´s University, Colima, Mexico. “The Antman” is a monster for his prey, in his microscopic world. It is a clear example of the beauty of nature. Width of the image is 3 mm. Honorable Mention: A fog day in the park by Ricardo Tranquilin, CDMF/LIEC/Federal University of Sao Carlos, Sao Paulo, Brazil. presented in this image is the titanium oxide deposited in aluminum oxide. Image width is 0.05 mm. Honorable Mention: Acoustic Levitation by Aleks Labuda, Oxford Instruments, California, USA. This micro-photograph depicts the first experiment in the field of hydrodynamic quantum analogs. These silicone oil droplets are bouncing indefinitely above a vibrating pool of silicone oil at 15 Hz. 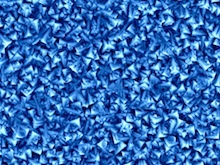 The surface waves generated by the droplets determine their spacing. These waves are analogous to quantum mechanical waves that guide the dynamics of quantum particles. While these droplets *move* like quantum particles, they *behave* like quantum waves. The droplets’ wave fields mediate their interactions with their surroundings, with each other, and even with themselves – similarly to electrons in the double-slit experiment. Such bouncing droplets were discovered in 2005 by Yves Couder and mark the first real-world demonstration of the pilot-wave theory postulated by de Broglie in 1927. This behavior provides measurable and intuitive insight into the mystery of particle-wave duality. Image width is 25 mm. Honorable Mention: MXene Lion on the Hunt by Armin VahidMohammadi and Majid Beidaghi, Auburn University, Alabama, USA. 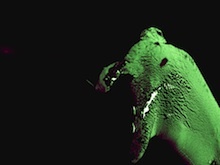 The image shows a completely oxidized two‐dimensional (2D) vanadium carbide MXene particle that resembles a head of a female lion. 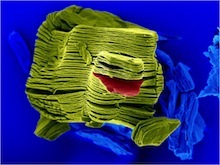 The image is taken with scanning electron microscopy and fake colors are added using computer graphics software. 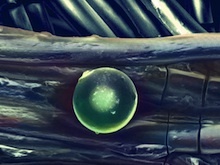 The teeth and the eye are the only things added to the image and no other manipulation has been done. Scale bar is 0.003 mm. Drexel People’s Choice: Nano-Duck by Kanit Hantanasirisakul, Drexel University, Pennsylvania, USA. This Nano-duck is Cr2TiAlC2 MAX particle. The size of the duck is ~3 µm. The rocks where it’s sitting on are also MAX particles covered with ‘nano-moss’. 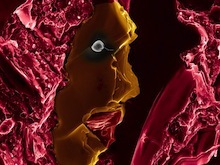 Want to see more NanoArtography previous winners? Check it out here!